When we got to the venue on Thursday night the Rev3 team was hard at work getting everything set up for athlete check in the next day. It turns out the container that contained all of the stuff didn't show up until Thursday at 5pm!! We offered to pitch in, but they had a ton of folks already helping out and sent us on our way. The next morning we headed down to the expo and it was amazing! They did such a great job. I checked in with the volunteer tent and helped out anywhere I could. I ended up spending most of my time in the transition area helping with bike check-in. 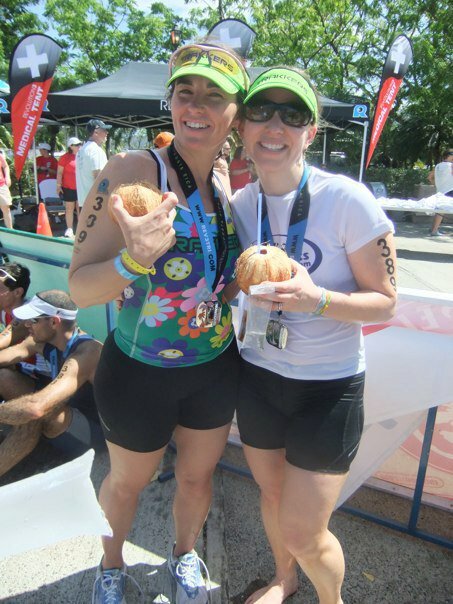 The Costa Ricans that I was working with were super cool about helping me learn some handy Spanish phrases for triathlon racing in Costa Rica. After they went off on the bike, I headed back to our hotel (within walking distance) and got some breakfast. I also put on my super cool temporary tattoo race numbers! Kati had assured me she'd be awhile on the bike, so I took my time. Of course I didn't really believe her so I headed over to the transition area and started to realize how incredibly HOT is was at this point!! 10 am and baking!! I ran into Andree in the transition area, already finished with her smoking fast Sprint race. She won her AG and seemed pretty happy. I went to find my transition area so I could put on my race belt that Kati had left there in the am for me. I was surprised to see her husband coming into transition from the bike. Wow! that was faster than they had expected. He indicated that they'd accidentally skipped one of the loops on the bike, so we'd all be DQ'd. Oh bummer. to be honest, I was kind of glad, because it got me running that much faster and it felt like it was getting hotter by the second. Kati came in just as Paul was leaving on his run. We laughed about the bike course mix up and switched the chip over to me and I headed out on the run! I really tried to go for it to start off with (Even though I'd been EXTREMELY adamant that I wouldn't RACE but just run the 10k). The course starts off on flat soft sand road along the beach. It then moves onto a rocky dirt road into a cool town next to the race site, Brasilito. The town was amazing. Tons of folks out on their porches cheering on the racers. the course is two loops so we got to go through there twice and it was my favorite part of the race. After you leave town, you climb uphill for about a mile, back into the race venue before flying down a super steep hill through the golf course (very pretty) through the transition area to head out on the 2nd loop. I'd worked myself pretty hard the first loop, but I have to admit once I headed back onto that sand road it was just too easy to find excuses for slowing down. It was hot, my HR was through the roof, my hip was hurting, I didn't want to injure myself, I'd just done intervals the day before, etc. I had A LOT of excuses and you know what? I slowed down. but I did take the time to really enjoy the experience. I loved that second loop, the cries of "Vamos! Vamos!" and the super cool guy that poured cold water on me. I laughed over the fact that every time I thanked someone in Spanish at the aid stations they said "You're Welcome" in English. :D The best part was when I started walking on the uphill section (my HR had hit 188 which is pretty high for me) and a family eating lunch on their front porch stated cheering for me to start running. When I started running again they all cheered!! It was very cool. I made it back up to the top of the hill and headed into the finish line, just as cool as any Rev3 finish and so much fun!! After I crossed the line, I received my super cool medal and a great finisher shirt with a cute little frog on it!! The best part of the finish... FRESH COCONUTS!!!!! REV3CR 2011 - Saturday Recap from REVOLUTION3 Triathlon on Vimeo. I had so much fun being part of a relay with Kati and I LOVED volunteering in transition the day before and helping folks with their bike racking and numbering. It was a wonderful start to our Costa Rica vacation!! We stayed at Paradisus Playa Conchal - literally 5 min walk down the beach from race start. Reserva Conchal where the race is held is beautiful and HILLY!! Loved it! The beach run on the race course was so cool, but be ready for it when doing the race. It is soft squishy sand. The dirt road is also very uneven so just be ready for that. The hills seem tough, but really just go for it, because next up is a fun downhill or a super cool finish line with COCONUTS!!!! That looks amazing! Thanks for the report! Wow... what a great experience. And I love the shirts!